Nashville Sounds radio broadcaster Jeff Hem has been selected to call the 2018 Huntington Bank Triple-A All-Star Game, presented by Gildan. He will be on the radio call of the 31st annual contest between the Pacific Coast League All-Stars and International League All-Stars at Huntington Park in Columbus, Ohio, on Wednesday, July 11 at 8:00 p.m. CST. The game can be heard in Nashville on the Sounds' flagship station ALT 97.5 FM, with pregame coverage beginning at 7:45 p.m. The Triple-A All-Star Radio Network will carry the game as well as all 30 of the Triple-A flagship stations. 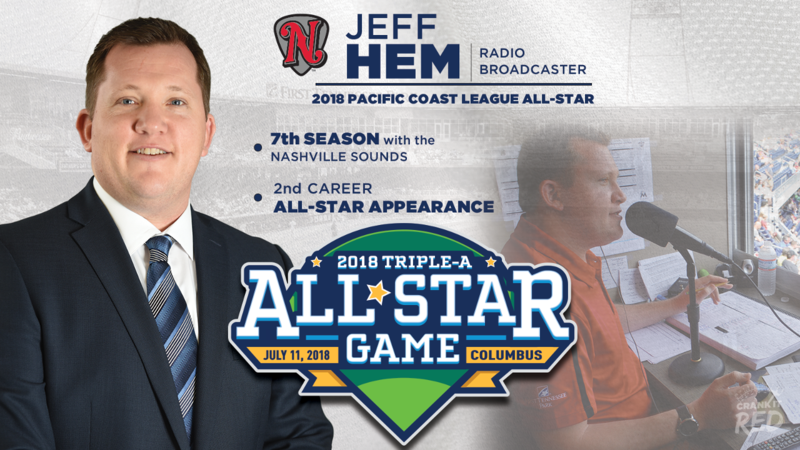 In his seventh season as the radio voice of the Nashville Sounds, Hem will be making his second career all-star game appearance. He served as the television broadcast announcer for the 2007 Midwest League All-Star Game. It has been a banner week for Hem, who will broadcast his first Major League Baseball game tomorrow night in Chicago. Hem will be on the radio call for the Sounds' parent club, the Oakland Athletics, when they play a doubleheader against the Chicago White Sox from Guaranteed Rate Field. The 36-year-old becomes the second representative of the Sounds to receive an All-Star nod, joining athletic trainer Brad LaRosa, who was named to the Pacific Coast League All-Star field staff on June 14. Hem is the first Sounds announcer to broadcast the Triple-A All-Star Game since Chuck Valenches in 2001. All-Star fan balloting is underway at https://www.milb.com/ballot. Voting ends tomorrow and the PCL roster will be announced Thursday, June 28.